Whether it’s just about springtime and you’re gearing up for cleaning or in the middle of summer, it’s always a great time to get started. And that’s why I’m sharing this awesome list of DIY green cleaning recipes. So you can save some money and do it yourself, but also not have to worry about the toxins you’re letting around yourself and/or your family. So check them out and make sure to follow the link to the original source to find the recipes. Then try them out and let me know what you think! Now I love this recipe for homemade dish detergent. It’s an awesome way to easily keep your hands germ free and your kitchen clean. 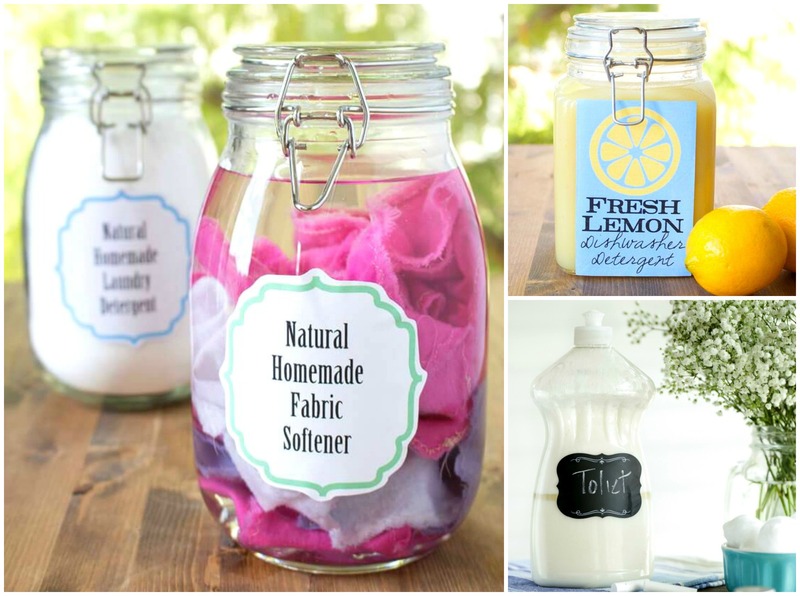 If you’re someone that uses fabric softener frequently when laundry day comes around, then definitely try this one out. It’s super simple! Now if you also need a recipe for laundry detergent, then I’ve got you covered for that too! Alright, I know I just shared a recipe for DIY laundry detergent, but I couldn’t help but do this one too. It’s so cute! Tubs (and tiles, but tubs especially) are just known for getting gross; what with grime building up from soap and dirt. So this one’s definitely a must! Now this homemade cleaner is for anything and everything. Go ahead and make this awesome smelling cleaner; you’ll have your home smelling like spring in no time! If you have guests coming over and you need to clean your bathroom (which has gotten neglected for weeks because nobody likes cleaning bathrooms), then try out this easy recipe for toilet bowl cleaner! Whether you just want to make sure you’re using non-toxic products, or you want to save some money (cuz let’s be honest, store bought cleaning products are expensive), these recipes are super easy. No need to rush down to the store and spend a lot of money for something you won’t use frequently. Just whip together some ingredients you’ll probably already have and you’ve save yourself some time and money! Now if you have any questions on any of these recipes, just let me know in the comments down below! I’d love to help you out!